At least 10 people, including a baby, were killed and over 30 injured in a fire at an eight-storey building here on Tuesday. A female suspect has been arrested in connection with the incident, the city prosecutor said. According to Paris' Fire Department, the death toll was not final as some of the injured were in a serious condition and firefighters were still searching the building where the fire broke out at about 1 a.m. local time. Fifty people were evacuated by ladders from the blaze in the upmarket 16th arrondissement. About 250 firefighters were deployed to the scene not far from the Bois de Boulogne park, helping to rescue those trapped on the roofs, the BBC reported. 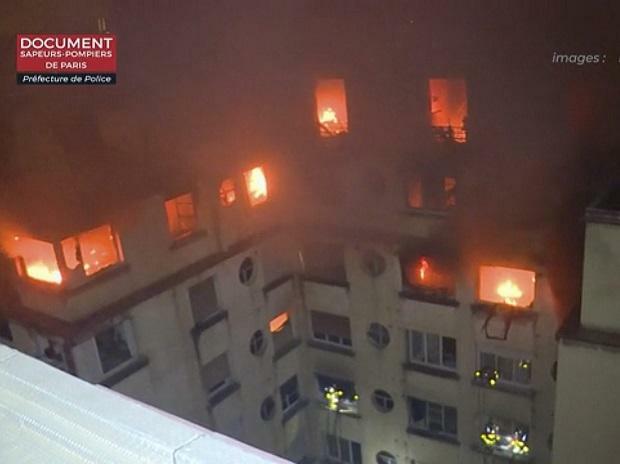 Paris prosecutor Remy Heitz, who visited the scene, told reporters that the incident may have been a criminal act and that a 40-year-old woman with a history of mental health issues was arrested not far from the building, shortly after the fire began, according to Efe news. Firefighters managed to control the blaze at around 6.30 a.m. The inferno mainly affected the interior of the building, which has an internal courtyard, complicating rescue efforts. Many people escaping the flames and the smoke scrambled to the roof of the building. The Fire Department said two blocks adjacent to the building on fire were also evacuated as a precautionary measure. An eyewitness at the scene told France Television: "The fire alarm went off at 12.30 a.m. a little after midnight, and smoke was everywhere already. I live on the 8th floor, the top floor, so I tried to pass from balcony to balcony to get away, And then, we huddled up in a corner, other people climbed up to where I was to escape the flames." French President Emmanuel Macron said that the country "had woken up to tragedy", and praised the fire services for their courage. Interior Minister Christophe Castaner said the fire started on the second floor and its flames spread with unusual speed. Paris Mayor Anne Hidalgo tweeted that the city "was in mourning" and the Council of Paris opened with a minute's silence. The 1970s building is situated on Rue Erlanger in the 16th district and near Bois de Bologne, a large public park, an area which houses upscale shops and restaurants and is popular with tourists.